Happy New Year! We look forward to gathering in Grand Rapids, MI for a weekend of conversation, collaboration and community at the Balanced Team Summit. We’re going to continue many of the elements that we’ve enjoyed at past events: a great location, a mix of invited speakers, community contributions, open space sessions and lots of social time. We have an exciting weekend planned, and look forward to your participation. 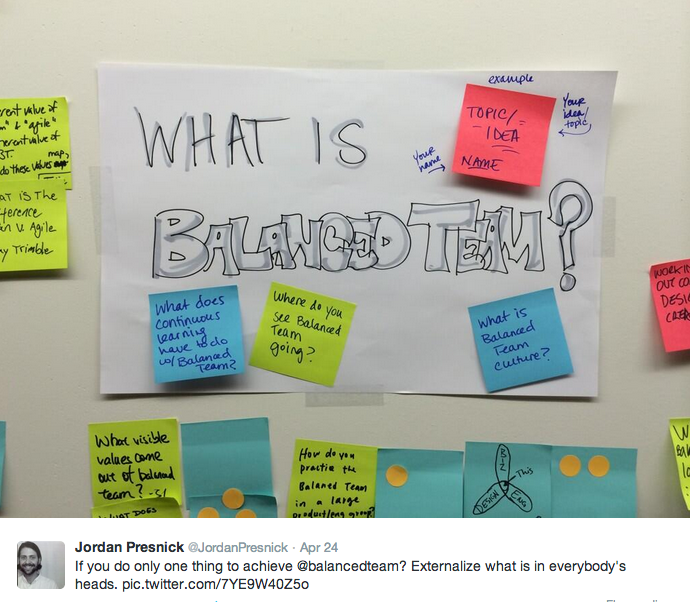 At its core, Balanced Team is a community and we’re eager to hear from your Balanced Teams. What Balanced Team techniques have worked well for you? What hasn’t worked well? What improvements have you made over the years that are worth sharing? Do you have a nagging question you want help from this group to answer? Are there big issues we need to address in the upcoming year to help build even better Balanced Teams? Please let us know what you want to contribute. If you have more than one idea, it’s OK to submit more than once. We’re accepting submissions through Friday February 6th, 2015. Thanks for reading this, we very much look forward to seeing you soon in Grand Rapids!! Hello friends! We are pleased to announce the theme for the Balanced Team Summit on June 13 and 14, 2015 in Grand Rapids, Michigan! We’re working on launching our conference website and will make a call for submissions soon. If you want to participate in the conversation about this event and help us plan, please join our Google group. If you would like to get announcements about Balanced Team events sent directly to your inbox, please sign up for our events announcement list. If we missed anything please let us know at crew@quietstars.com! We’re pleased to announce that we will be holding a Balanced Team Summit on June 13 and 14, 2015 in Grand Rapids, Michigan! The planning committee is made up of Rick Harlow of Visualhero, Gail Swanson of Manifest Digital, Lane Halley, and Matt Fletcher and myself, Brittany Hunter, from Atomic Object. The event is a year from now, so we’ve got plenty of time to plan a great conference. Currently, we’re working to secure a great venue and choose a theme. We’ve got some great ideas, but everything is under consideration at this point. Is there a particular theme or question you’ve been wondering about and would like to further explore with fellow Balanced Teamers? Let us know by filling out our quick google form! We are all super excited to host the conference next year. See you then! 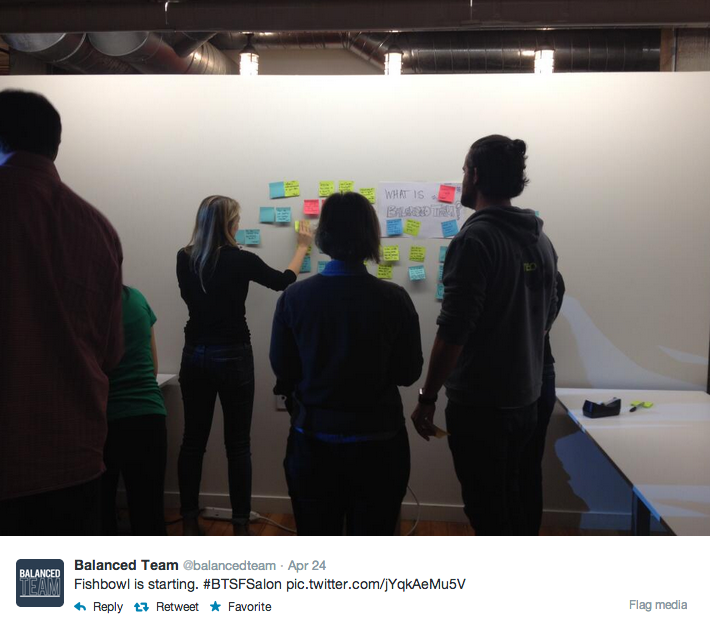 We’re pleased to announce a Balanced Team Salon April 24, 2014 at Carbon Five in San Francisco CA. Salons are becoming popular format in the BT community as they involve plenty of networking, short talks from people in the community sharing what they’ve learned and then a fishbowl – a collaborative, inclusive conversation that allows many people to get involved and share. With quite a few people in our SF community coming back from an amazing day-long BT NYC Salon we thought we might bring some of that energy and discussion back home. Our talks will share some of the learning and intrigues from the Salon and Lean UX 2014 conference. And then we’ll pull out some of the more intriguing themes and topics that were discussed as starters for our fishbowl. Please feel free to invite new folks to come along. We know that our diversity always makes the conversation more fun!